In 2007, the Guardian announced that Playa de Rodas was the best beach in the world, a reputation which was followed the beach for better or worse. Don't get me wrong, in my opinion Playa de Rodas definitely deserves to be the best beach in the world. The sand is fine and white and the water is crystal clear. There are all kinds of gulls and sea-birds and you feel like you're miles from civilization. 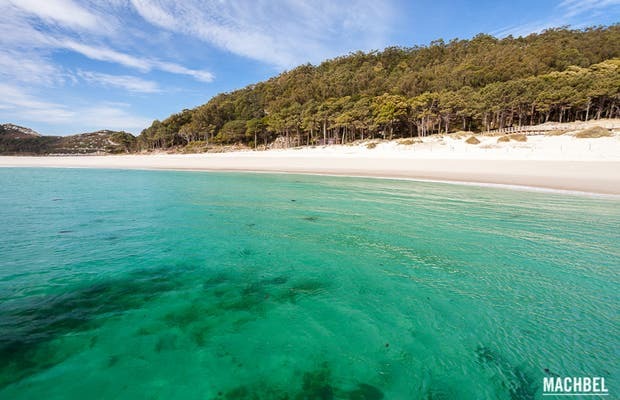 It's about 1.2 kilometers long and a walk along the beach offers nice views of the Vigo estuary and the Islas Cies. Getting there is easy: the ferry to the Islas Cies lets you off right at one side of the beach. This is a true gem of a beach, even on a cloudy day. Not even the clouds could cover up the beautiful white sand and the crystalline water. Make sure to explore the rest of the island.